September 15, 2015: I woke up at 4am this morning, got out my Galaxy Tab4, and followed the Tweet feed for the Monday Night Football game of 49ers and Vikings via the NinersNation web site. By 7am, the game was over, Niners victorious, and it was time to get up and start the day. We dressed, got our bag downstairs, and walked over to the restaurant section and ate breakfast of, you guessed it, OJ, toast and coffee. Heather and I both pulled our ponchos out, certain that we would need them soon, based on weather reports we had seen, and a quick look at the skies outside the hotel through a transom window in our room. 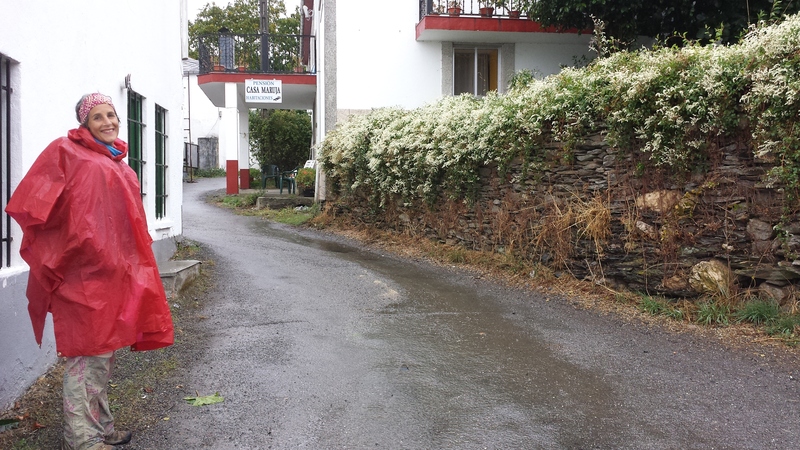 We made our way back down the rua Xeral Franco and headed towards the reservoir via the twisting road across the inlet that led to the uphill track to Toxibo. 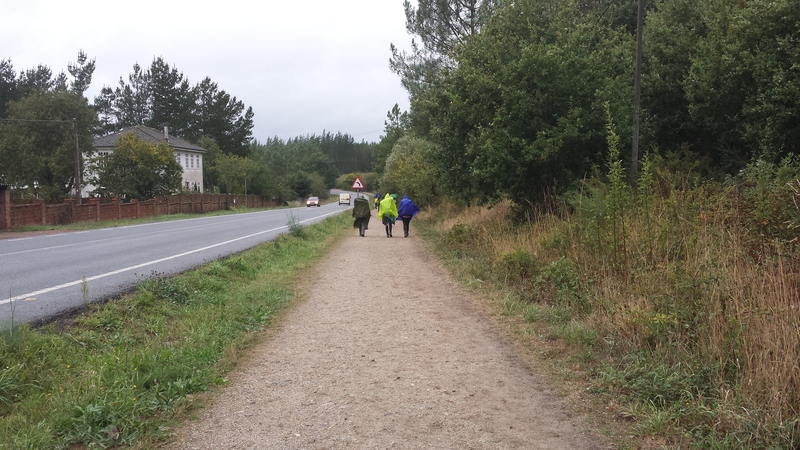 Once again, we noted how crowded the Camino had become. There were many who passed us, still fresh from just starting their walk. “Wait another day,” I told Heather. It would be at about that point that their calves and feet would begin to feel the stress of climbing and descending too fast. By the time we reached Toxibo, the rain was coming down steadily, and the wind was picking up speed. We had heard on TV that this weather system was part of a tropical storm that they were calling “Henri”. Soon, we crossed over the N-540 and continued upward until we reached the high point for today at Sierra Ligonde which is about 2,400 ft. From there it was slowly downhill through the blowing rain until we reached our destination in the little hamlet of Lestedo where we stayed at Rectoral Lestedo, a beautiful casa rural right on the Camino. A roaring fire in the lounge greeted us once we had settled in and showered. Dinner that night was truly the best we had the entire trip with a delicious roasted chicken as the main course. WiFi was not working well in this somewhat remote location, an interesting contrast to the modernity of the establishment. The owner apologized for this inconvenience, but I was actually quite happy to be effectively cut off from everything for the evening. We met all the other guests at dinner. There was a mother and daughter from Australia, four Americans from North Carolina, and an American couple we had seen several times on the way that day who were from Newport Beach, CA. By 8pm we were flat out tired from our days trek and needed sleep. And that we did, quite easily.